Flasc sells BT, Tippmann, Tiberius and Azodin markers and has an amazing array of awesome barrels. 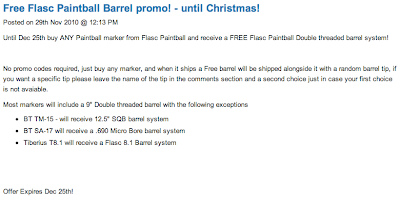 Get in on the promotion before December 25th and get a free barrel and tip (of your choosing) with the purchase of any of these popular markers. Yet more savings for No Money November! Here are some articles on FLASC products.